Flesh Sculpture is an epic Neutral support card. It is part of the Dark Brotherhood story set. A playset of the card is awarded for completing Princess Barynia. The premium version can only be obtained by soul-summoning, which is only possible after the completion of Princess Barynia. 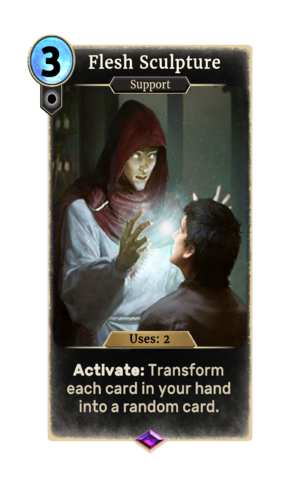 The card's art depicts Galathil, a flesh sculptor who appeared in Skyrim. If you activate Flesh Sculpture, it will change your in-game avatar until the end of the match. This page was last modified on 24 September 2018, at 22:46.